Annual Report (AR) beginning January 1 (GongLi 公曆, 1580 BCE) in the proleptic Gregorian calendar is 11-24 Adar I (אדר, YinLi 陰曆) in the Hebrew calendar. 13 January (GongLi 公曆) proleptic Gregorian calendar: 12-7 Adar II (אדר, YinLi 陰曆) lunar calendar is the Jewish traditional date of the birth of the Biblical Moseh—“And the woman conceived and bare a son and when she saw (תרא: Thera; Santorini) him that he was a goodly (טוב) child she hid (תצפנהו) him 3 months,” (until 3-7 Sivan) then “…she took for him an ark (תבת) of bulrushes” (גמא, Belarus, capitol Minsk) “…and the daughter of pharaoh…saw the ark (התבה) among the flags” (הסוף). Moseh is the image of Yeshua; Arabic: ISA (עשא; “he do”) to come combined with thera (תרא), the same concept of OSIRIS (עשתרא; parsed: עש; “do” + תרא; “she saw”) were is seen the eruption of Thera. 5 February (GongLi 公曆): 1-1 Nisan (ניסן, YinLi: 陰曆) is the prepared straight (正: Zheng) 1st day ZhengYi (正一) of the 1st lunar month ZhengYue (正月) 1-1 of the Chinese lunar year YinLi (陰曆). 3rd/6 years of the reign of Shamshi-Adad II (שמשי-אדד), the son of Erisum in the original list of Assyrian kings is #57, the 26th/77 and the 25th/39 kings of the old Assyrian period covering 6 annual limmum (לימים); "years," the 21st/81 heads or chiefs ShiShou (釋首, 석수); the "release head or chief" according to the Assyrian Standard Guideline. 26th/28 years of the reign of Abi-eshuhAbi-eszuh (אבי-עשוה) the son of Samsu-iluna, the 8th king of Babylon reigning 28 years, the 16th/81 heads or chiefs JiaoShou (交首, 교수); the "exchange head or chief" according to the Babylonian Standard Guideline. 124th/248 years since BC AYN 1702 of the Edomite Kingdom before any kings reigned over Israel. Esau (עשו) sent to Pethor (פתור); “soothsaying” or “interpreting,” which is upon the river, and they fetched from there a young man of beautiful eyes and comely aspect, whose name was Saul (שאול), and they made him king over them in the place of Samlah. 1st/40 years of the reign of Saul (שאול) of Rehoboth (רחבות) by the river over all the children of Esau (עשו) in the land of Edom (אדום), the 6th/8 Torah Kings that reigned in Edom (אדום). 34th/50 years of the reign of Piqos Faunus over the children of Chittim (כתים); “Cyprus” (צפר). 1st/40 years of the Period of Moseh in Pharaoh’s Palace in Egypt (הגפת) begins. 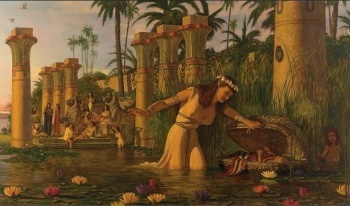 3-7 Sivan (סיון, YinLi: 陰曆), 22 April (GongLi 公曆): when Moses’ mother “could no longer hid him she took for him an ark (תבת) of bulrushes” (גמא) and daubed (תחמרה) it with slime (בחמר) and with pitch (בזפת) and put the child therein; and she laid it in the flags (בסוף) by the rivers (היאר) brink” (שפת) “And the daughter of pharaoh (בת-פרעה)…saw the ark (התבה) among the flags” (הסוף); “rushes,” “weeds” or reeds (red) of papyrus stalks (Cyperus papyrus). 350th/400 years of the 1st/6 historical periods of Image Time-identity on the national level extent, scope or context of the providential Period of Slavery in Egypt and 350 years since Abram (אברם) was told that his seed shall be a stranger in a land that is not theirs in including BC AYN 1928. This page was last modified on 4 January 2018, at 08:35.